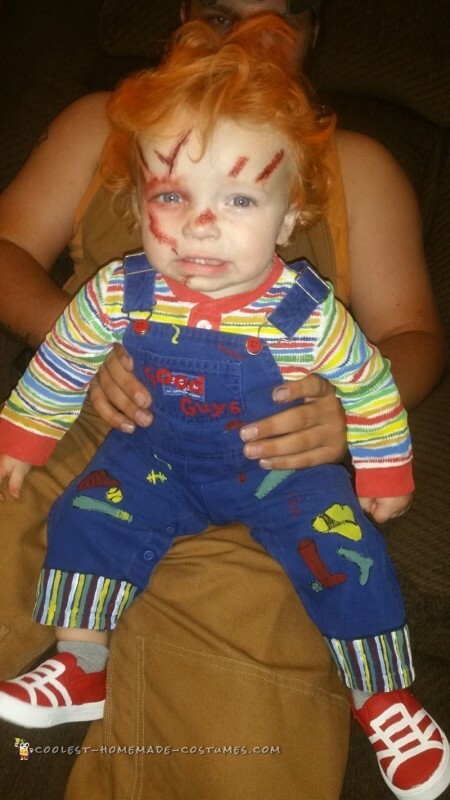 My grandson is 13 months old and as soon as he started toddling around we knew he had to be Chucky for Halloween, something about his walk said he would make the perfect Chucky… and he did!! To make the Chucky costume, I first found temporary tattoos online of the stitches and cuts for his face. I only paid $2 for them and they were perfect, though we were in a panic because they didn’t arrive until Halloween morning. We found his shoes and blue cordaroy overalls at a thrift store… only paid $8 for both. The shoes were black and I painted them red and white to look like Chucky shoes. I hand painted all the decorations on his overalls also. We never could find a striped shirt that we liked or look like Chucky’s shirt so we bought a white onesie and hand painted the stripes on that as well. We finally got all the painting done about 30 minutes before trick or treating time, lol, we had to blow dry the shirt! My daughter put the tattoos on him while he was sleeping and then we got him dressed in his Chucky costume and she sprayed his hair with orange Halloween hair spray. We took him trick or treating and had quite a variety of reactions to him… some were actually scared of him!! 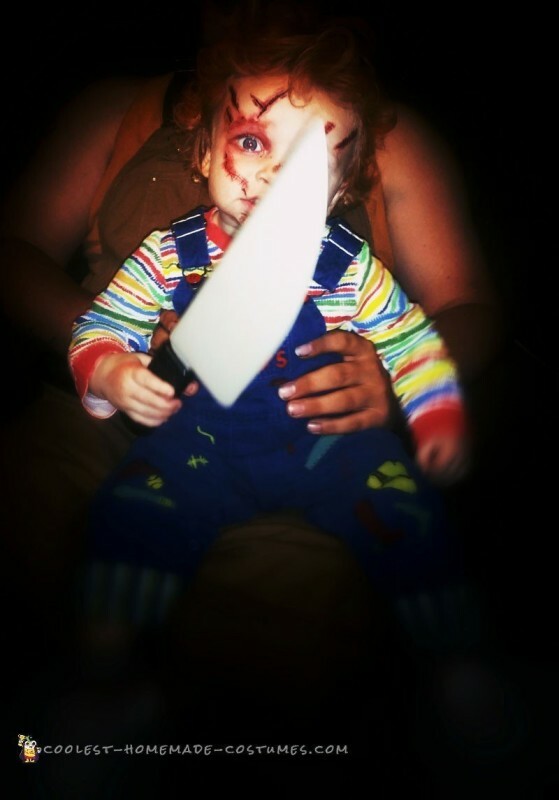 Most were just amazed by how well he pulled this Chucky costume off… he was a great Chucky! I’m of course bias, but I think we nailed it on this one!! 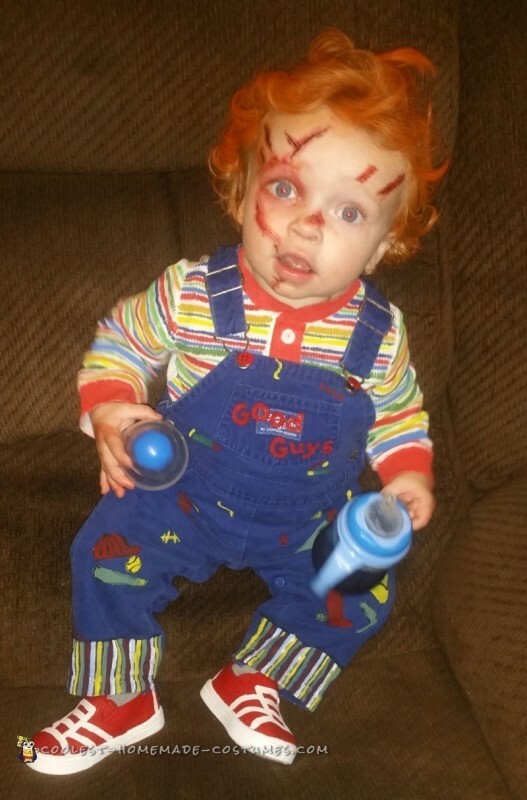 Hope you all enjoy this Chucky costume as much as we did!